Here is the top 5 list of best rated Battery Powered Weed Eaters for 2018. As you can see there are a lot of Black & Decker cordless weed eaters in the list but also a few others made it in the top 10 list. Click here to see the entire best selling list. Below is a comparison table for the top 5 best Battery Powered Weed Eaters. 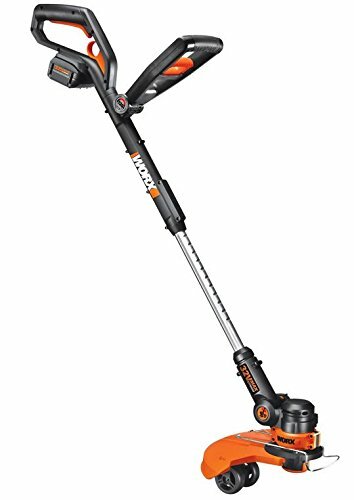 The good: What makes the Black & Decker LST136W 40V Max Lithium String Trimmer better than corded grass cutters is its ability to reach corners and edges of the lawn. Since there are no restrictions as to how far it can go, you can easily trim grass in all corners. The trim quality is exceptional as well, provided you have set the trimmer in proper setting – set it to 2-3 for light to moderate work or set it to 6 if you need it for heavy cutting. The trimmer uses lithium batteries to operate. When used on low to medium setting, the batteries can last for 45 minutes at least. The Bad: It is not advisable to use two different brands batteries at the same time because it causes them to fail. Only use the lithium batteries that come with the product. You will not like it when the Black & Decker LST136W is set on high for heavy trimming because the batteries die after only 15-20 minutes. The Good: it is easy to assemble and the power is adequate even for large weeds. The trimmer is quiet and nearly vibration free. It is easy to handle as it is lightweight. A few reviewers state that the small battery works well enough for this trimmer and makes it more lightweight to handle. The Bad: Battery and Charger are not included – for most of us a nuisance to search them separately. You need the machine whole to work and without putting a lot of effort in finding all the compatible items. The spool / trimmer line which comes with it seems to clog the feeder on the trimmer with a lot of reviewers. When replaced by a universal trimmer line the problem seems solved. The Good: the WORX WG175 32-volt Lithium MAX Cordless Grass Trimmer and Edger should be your choice if you need a good trimmer and edger at the same time. Its performance is exceptional perhaps also because it is so light and easy to control. The batteries charge to full in less than three hours and can be used for quite a long time. The Bad: However, tall people may find the WORX WG175 difficult to use. It is a bit short. Replacements for batteries are difficult to find so you have to order it directly from WORX. Furthermore, the string breaks too easily. Even when you use the spool that comes with it, the same thing happens. 2 out of 3 are still going strong since 2014, namely the Black & Decker LST136W and the Worx WG175 MAX, see their reviews below. The other one is new in the top 10 and it’s review will follow shortly. The Good: The Black & Decker LST300 is a very popular trimmer in the bestsellers list. I think the big attraction is the huge lithium battery. It should give the user more run time and those reviews I read said they have enough time to wack their garden. Besides the longer run time another pro of this Battery Powered Weed Eater, the LST300, is the price. It is one of the cheapest models. This is a 12 inch trimmer running on a 20 v Lithium battery. With it’s 7 Pounds it is lightweight and as the length of the shaft of the trimmer is adjustable his trimmer is very usable for smaller people. The Bad: This trimmer has one speed level and a normal battery charge will last you about 30 minutes of weed eating. Summary: For a basic cordless weed eater this is not a bad choice. It has a little less options then the more pricey ones and a little less power too but for the simple to average garden it is good enough. Certainly when you take the price in consideration. 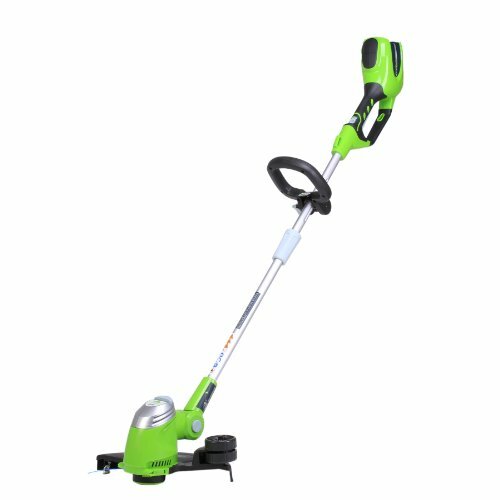 This is a 20-Volt Lithium-Ion Rechargeable Battery Powered String Trimmer and Edger by the brand Weed Eater which has very good reviews on average but the price creeps up almost to normal price ranges. Lightweight. A weed eater with a 20 v lithium battery. This model comes with a better battery which lasts longer. It can be used as a trimmer or a wheeled edger. It has 2 speed power levels for when you need more power or extended run time. Let’s end with Short reviews of other Battery Powered Weed Eaters. Ability to change speeds will enable you to trim different vegetation, which adds to versatility of the tool. This is light-weight tool, weighting at only 7.7 lbs. This Trimmer and Edger comes with pull-out metal guide that allows easy transition from trimming to edger, and enables satisfactory finish of even more demanding edging operation. Handle is adjustable by height which provides additional comfort and enables reliable control. Included: battery and charger, 2 year warranty. The Worx WG168 40V Trimmer and Edger is an excellent choice for trimming and edging operation, and it will easily defend various types of overgrown vegetation. It is reliable, easy to handle, and lightweight, which is probably one of its best features along the strong and reliable 40V. battery engine. Steel shaft with molded rubber handle will enable you easy control and maneuvering during trimming and edging operations, while at the same time assuring durability of the tool itself. The cutting diameter is 13 inch wide, enabling you an easy and fast trimming operation. This versatile tool with pull-out handle will easily change from trimmer to edger. You just have to rotate the trimmer head and extend the metal guide to easily move along the sidewalks, driveways and patios. Your trimming will be low-noise and convenient, as trimmer is designed in such a way to minimize vibration and make your trimming operation easy. Battery charges within 3 hours, and once charged will not loose power until ready for use. Who should buy the Worx WG168? This Trimmer and Edger is an excellent tool for home owners who have demanding laws with versatile vegetation to care for. The operating is reliable and easy, as this is really light-weight machine weighting under 8 lbs, that will ensure owners satisfaction and enable prolonged trimming and edging operations. Battery charges fast, and assures long operation, as the power will not be lost until the next operation. The Black & Decker LST220 12-Inch 20-Volt Lithium-Ion Cordless GrassHog Trimmer/Edger is not like other grass trimmers because this one is easy to assemble, with the help of its manual. It is very light and easy to handle. In fact, the handle can also be rotated 360 degrees and is adjustable to appropriate height, which makes trimming exceptional and fast. It is better to use than the traditional bump and feed grass trimmer with its auto-feed feature. The disadvantages of the Black & Decker LST220 include short battery life, which is only more or less 20 minutes. It is so not worth it because charging its batteries take eight hours. It uses only one line for trimming thus taking more time to finish an area. The Black & Decker LCC420 String Trimmer and Sweeper Lithium Ion Combo Kit, 20-volt is also a newcomer in this best seller list. It surprises me that this one is one the list as it has only one review at this moment. It is the newer version of the Black & Decker LCC220 which is rated 4.2 out of 5 by more than 500 reviewers. If there is one thing you’ll love most about the Black & Decker NST2118 12-Inch 18-Volt Ni-Cd Cordless Electric GrassHog String Trimmer/Edger it is it’s outstanding performance. Its motor never gets choked or bogged. Its string also works very efficiently allowing perfect trimming and edging. It is well-built but very light. The head is easy to control and can also be rotated. Furthermore, it only takes about 5 minutes to assemble. However, the batteries of the Black & Decker NST2118 take 8 hours to fully charge, but you can only use them for several minutes. The batteries also die too quickly – only after a year so you have to get replacements year after year. The GreenWorks 21242 G-MAX 40V Li-Ion Cordless String Trimmer with 4ah Li-Ion Battery and Charger comes with a manual, and is easy to assemble. Its high performance is great in trimming the lawn. The line-feed works perfectly, and you can simply adjust the angle of its motor to the shaft if the need arises. Also, the battery charges to full in just about one hour, but takes you 45 minutes or more to use. The issue with the GreenWorks 21242 lies within the batteries. They only last for up to a year, which means replacements are needed. Furthermore, they are not as effective for edging. You will need to use another cutter if you like a perfect edge. The battery capacity: A typical 1/4 acre home probably doesn’t need much more than 15 or 20 minutes of run time to effectively get through all the trimming duties. The cutting diameter: Trimmers range varies between the 12 inch and the 16 inch. The smaller diameter trimmers tend to be more battery efficient. The trimmer line: efficiency depends on 2 factors: The diameter of the line. most trimmers come with a 0.080-inch trimmer line but a 0.095-inch line is thicker and breaks less easily. Often this line will fit too. The other factor is the easy of line feeding. The attachment capability: if you can attach different heads for string trimming, edging, and hedge trimming, and even some other things, it can save you money and space in your shed but it often leads to reduced quality for one or both usage methods. The sound level is much better: This is much better for the relationship with your neighbor! And it is nice for your own ears too. The Balance: is not that a big item with battery powered weed eaters. Most have the battery on one end and the motor on the other end of the shaft so it is more or less balanced. The vibration: is neither a very big item on these battery powered trimmers, at least not if you compare it to gas powered weed trimmers. If you really put them side by side there is a small difference but for a normal home garden usage like 30 minutes a week it will not be a big deal. Here is a list of the more well known brands. There are loads and loads of sub types.